← Tire Bouchon, D’Ourea, Adrien Roustan, Vacqueyras, IGP, France, 2014, 13% abv. From a site located in the western part of Savennières and north of the Loire River, Brittany native Loïc Mahé grows bio/organic grapes on shale soils and makes unfiltered wines fermented with natural yeasts and few interventions like sulfites or chaptalisation. Yes, it’s admittedly difficult (although not impossible) to find in North America. Make the effort though – it tastes great. On the eyes, a translucent ruby with pristine aromas of crunchy raspberry and green leaf with a mineral kick. The palate is dry with scratchy tannins and medium minus body. Flavours show very clean raspberry and tayberry with more green leaf and a strong finish. So clean, elegant and layered, it’s WSET Very Good and went perfectly with BBQ chicken, corn on the cob, summertime cherry tomatoes and purple field peppers. 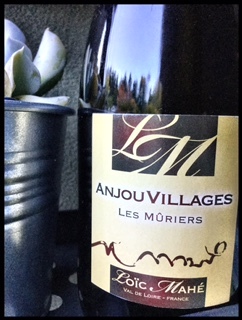 This entry was posted in Cabernet Franc, France, Loire, OTHER, RED and tagged 2013, Anjou Villages AC, bio, cabernet franc, france, Les Muriers, Loïc Mahé, loire valley, red wine, savennieres. Bookmark the permalink.